This post really isn’t about Egypt. I heard last night that most Americans don’t show any interest in the Egypt story. (I’m just weird, apparently, in yet another way). So if you hate international politics, please indulge me and keep reading. I have been thrilled and obsessed by the revolution taking place in Egypt. I put the Al Jazeera English live feed on my computer and left it on, watching people gather, chant, mass, get tear gassed and beaten. In my heart, I cheered them on toward democracy, proud of them for grabbing this moment to end their suffering under the present government. 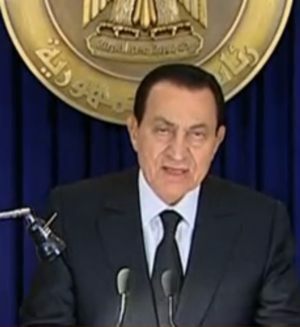 Then word came that the dictator Hosni Mubarak was going to make a statement, and I rejoiced – he was going to step down! Mubarak’s face was difficult to read as he spoke, partly because he didn’t have a TelePrompter, so he had to look down a lot, but it soon became clear what was hidden behind his politician mask – the man was beyond angry. His words made it clear. He didn’t seem to understand what the protesters’ demands were. Instead, he blamed them and complained that the only reason they had the freedom to protest was because of reforms he had made – he had been doing them a favor and they just didn’t appreciate it. He didn’t step down. He said he had dismissed the cabinet and that he would appoint a new cabinet. That would fix everything. Done. Goodbye. I sat stunned by the man’s cluelessness. I tweeted that he didn’t know he was a Dead Man Walking. It was almost comical, his level of detachment as his world crumbled around him. I see that something his wrong in my life. I know I need to do something. I put it off for a while. The situation becomes more urgent. Finally, I can’t ignore it any longer. So then, I look for someone to blame. I blame everyone I can think of. I convince myself there is nothing that can be done. I decide to take a small action instead of addressing the whole, overwhelming problem. I tell everyone my problem is solved. I wake up. I still have the problem. Ha ha! In so many areas of my life, I am as wrongly controlling and blaming as any foreign dictator. It is only when something rises up – back pain, my pants don’t fit, my bank account is empty – that I have to take notice. I have to start governing more democratically, or face the mob of my problems. I so did not see that metaphor coming, but it is awesome. I hope I am cuter than he is, though. Oh wow, I think we were separated at birth. I do the exact.same.thing. And, if it makes you feel any better, it never has worked for me either. I hope the admission will help. In other news, I replaced my cabinet. Please so. I need overthrowing sometimes. I’m a little in love with this post. It could be worse, better to be a mini-Mubarek than a mini-Mugabe which I guess would be ignoring the problem and then kicking the shins of anyone who says there is a problem and then hiring some other people to also come along and kick the same shins until no one says there is a problem at all. Mini-mugabe LOL. Don’t give me ideas. Awesome that somebody in the US who isn’t involved in public life is interested in Egypt, and not the one in Tennessee either (I made a joke once on Angela Pudding’s blog about Egypt Tennessee & she was the only one who got it), and even more awesome that he’s obviously listened to you & is stepping down. The man is an a**hole. Ditto Mugabe. Now all we have to do is get rid of somebody in somewhere that might be North K**rea & life will ease a little for a few people. You rock, SueBob. I don’t know why more people aren’t paying attention. I am having hard time thinking about anything else. It’s the “gradual” thing that’s the stinker. If problems occurred over night, you’d know exactly what to do. But, it’s that sneaky uppie kind of thing. You get used to something… even if it’s bad. Yes, and then it is hard to imagine how good things can be because we get used to the bad…sigh. We’re funny, aren’t we? Wise words, Suebob. I am slowly learning this lesson, too. That’s all we can do – keep learning, right? Oh yes, lady. OH YES. Me too. It takes me sooooo long. And I appreciate how you turned this on yourself so humbly, really. you’re a class act. Tis true. Aw Heather. You are so kind. Love how you sum that up. Unfortunately I can totally relate. Thanks! Have you ever even been to Egypt? Do you even know what its culture and traditions are like? Or is it that, just like most of your ignorant and boorish countrymen, you are passing snap judgements based on one single pro-American source? Huh? You and your country have already imposed democracy on Iraq, killing thousands of people who were “sufferring under then government”. Stay out of this! Go eat a hamburger! LOL I think something was lost in translation…this post isn’t about Egypt or its politics. I am TOTALLY obsessed with the Egypt situation. We should go to lunch and discuss the whole thing. How do hamburgers sound? I don’t know how we could discuss it intelligently, given that we only have ever looked at that one pro-American source and given how boorish we are. Also, as a vegetarian, asking me to eat a hamburger while pondering political happenings that I am too dumb to understand is a little much to ask. Putting therapy on my To Do list right now.